I need you to calculate the total time it will take this ceiling fan to come to a stop, and then explain your calculations. I think the keywords are “rotational kinematics” but I’m way out of my depth here. I’ll call this off and post the third act (the answer) when someone gives an answer that’s inside a 10% margin, paired with an explanation. The winner gets the keys to my heart. BTW: Let’s get a few guesses in there also. Totally from the gut, informed by experience only. I’m interested to see who gets closer — the analysts or the guessers. BTW: Don’t hesitate to get your students in on this also. BTW: Yes, I already gave this a try but I was undone by the fact that I gave both the first and third act in advance which led to a lot of handwaving and glossy explanation. 2011 Mar 9. Frank Noschese gets inside the 10% envelope. His explanation, screencast, and Python script. Here’s the answer video, also. I’d expect friction from the base to be constant, and friction from the air to be decreasing with the square of the speed. It’s been 10 years since I studied anything with the word “rotational” in it, but I think you could figure this out with a kind of ordinary graph of rotations per second. I think rotations/second is probably a decent way to go. I’m no physicist, but I’m guessing the (constant?) friction from the base overwhelms any air resistance, so you end up with a roughly linear relationship. I timed a few individual rotations, turned that into rotations/second, and plotted that value against the time. Once you swag a line through there (and it looks pretty linear), let’s say we get to 0 rotations/second in the neighborhood of 40 seconds after you yank the chain. I pulled this into Tracker video anlaysis, and measured the initial angular velocity to be 4.68 rad/s, and the angular acceleration to be 0.135 rad/s/s, which gives a time to stop of about 35 seconds. Now in this equation the first term stands for the final rotational velocity which will be zero. The second term stands for the initial rotational velocity which using the video I got to be about 1rev/second. The time is what we are solving for. Which leaves us with alpha. This is our deceleration and we need to find it. Now using the video again I got the velocity at 15 seconds to be .584 revolutions/second. This allowed me to use this above equation to get an approximation for the deceleration. I got that to be -.027 revolutions/second/second. The negative confirms that the fan is slowing down and we know we are on the right path. Now a note here since I am human my timing can be off it would be better if you could be there with a stop watch and make the measurements, but even then their will be some error. Now back to the problem. Using the deceleration of -/027 revolutions/second/second we can solve for t. Doing this I got a time of 37.04 seconds. Feel free to correct me anywhere I made a mistake. Interesting – I used Tracker as well, and got somewhat different results, until I realized that I had to set the frame rate manually to 60 fps. I got an initial angular v of about 9.5 rad/s, an ang. accel. of .272 rad/s^2, and a time of 37.3 seconds from the beginning of the video. I only fit the line to the section of the graph after the switch was pulled. Changing the frame rate seems like a barrier to entry here, though. I can explain how you would do it (my degree is physics) and it is rotational kinematics. Essentially you’d pick a blade and plot it’s angular position as it goes around including all full circles of rotation it’s gone through already. The kinematic equation you are after is a quadratic with time and you can fit a curve like any other quadratic. since it’s slowing down the “a” coefficient of the quad will be negative and you are looking for the vertex to determine the time at which it stops. Without the ability to download quicktime movies of Vimeo I am unable to throw it in LoggerPro at this time but the analysis is pretty easy to do once it’s in there. I wouldn’t use the acceleration/velocity kinematic equation because measuring instantaneous velocity at the start it a much harder thing to do than the initial position. @Mark, there’s a link to a QuickTime download of the video. Not much to add, though I have done this with the video analysis function in Logger Pro. I then usually copy and paste into Excel for the analysis (I know, I know). First, convert x and y coordinates to theta coordinates. You can’t do this with the ATAN function, you need to use ATAN2. Then plot theta vs time. You will have to manually add 2*pi after one full rotation, then again after the second, and so on. Once you have a column of times and a column of corrected thetas, do a new column of delta theta over delta time, and graph that vs. time. Then use the slope of that graph to determine angular acceleration. Or, don’t bother with the graph and use Excel’s LINEST function to generate the slope and intercept, with uncertainties, since there will undoubtedly be uncertainty in your result. (i.e. we can’t predict when it will stop and guarantee you that that exact moment is when it will stop. There will be some range of possible values. Ideally, we would have data for multiple trials to reduce the uncertainty). For me, the proof is in the physics pudding. If I’m a student of yours (and for the moment I am) and you tell me that physical models can explain the world around me, including that fan, I’m going to want to SEE that. So merely explaining an analytical method leaves me kind of cold. Explaining an analytical method that’s led to an answer within 10% of the margin? That’s hot. And no one’s done that yet. The very first thing I did was time the video with a stopwatch to determine that the video was being played at half speed. I wanted to use vf=vi+at, with vf = 0 rad/s–the final angular velocity), vi = the initial angular velocity, and a the angular acceleration. I determined vi by counting rotations before you pulled the off string and timing with a stopwatch. I did a bunch of trials and got an average angular speed of 9.283 radians per second. This yielded an angular acceleration of -0.304. Plugging this in to vf=vi+at gave me a t of 30.5 seconds. Their is one problem with wanting it within 10% error. Physics is not math and since I have the pleasure of teaching both I see this problem a lot. With math you want an answer and you want it to be right on or very very close. This is not how physics works. Sure we can get close but that is all. With this problem we have to make a lot of assumptions. You have to assume no air resistance, constant deceleration, that their is a uniform mass, and many other things. All of physics is about models and all of those models are wrong but they explain things the best we can with them. I do not know if getting within 10% is possible without making this problem really ugly with a lot of other things built into the equation. For example air resistance which we then need surface area of the fan blades. If you want to get within the 10% the only way I see us doing that is with logger pro or some other computer program, because doing it by hand with formulas will only get you so close. I guess my whole point of this is the difference between physics and math. In math you want an answer, but in physics you want to understand how it works and get close because you understand that you are leaving things out that will effect your results. The real world is very messy and hard to get precise answers. This is in fact a more complicated problem that you would see in a freshman physics (I/II) class, since there is a significant velocity-dependent force from air resistance. Are you looking for the full treatment, or the simplified “ignoring air resistance” model? A brief perusal of Serway (3rd ed.) shows that air resistance is discussed as a velocity-dependent force, but I do not see a treatment of (for example) projectile motion incorporating drag. I suspect this topic came up in the later mechanics course(s). Just sent you my excel. Here’s my method. I used the post-its and VLC in slow motion to record the time at the end of each rotation. I made a table out of the time-rotations pairs and let excel fit a quadratic (which I already knew is right for constant acceleration). Then I found the vertex using -b/2a which corresponds to the time when the fan stops rotating forward. That gave me 33.7 seconds. I’m willing to bet it’s good to within 10%. @Jim all physics is an approximation so at some point you have to simplify something. For a 10% margin of error you could ignore a lot of important factors including calling air resistance approximately a constant for most of the slowdown. If you really wanted to get into the hairy of it you could use a discussion of internal friction relating to speed to guess that what ever number you came up with it’s probably a touch earlier since friction explodes near the end. Solving a second-order differential equation (in which I assume friction to be proportional to the angular velocity and approximating air resistance as a constant), I get 58.82 seconds. The problem eventually distills down to the fact that, as the fan slows, the acceleration changes, as a function of the velocity of the fan. Trying to break out each individual force is apt for failure, so I decided to simply model this with a second order relationship between velocity and acceleration (due to exponential grad, and lower order terms). I stepped through the video and noted every moment any blade pointed down, and then used those points to calculate the angular velocity ( * 4, due to there being 4 blades). Smooth it out a little due to aliasing with your 30Hz frame rate, find the polyfit between the acceleration and velocity, and then take every initial point, model it out to finish using 0.01sec step sizes, and find the average finish time. This could probably be improved by weighing the later data points heavier due to the signal-to-noise ratio getting better as the fan slows. In the end, my favorite answer is 46.7 seconds, but if you smooth the data using an even filter (point = mean(point…point+3) instead of an odd filter, the model jumps to ~62 seconds, so I can’t tell you which one is a better solution. OK, so at first I wanted to use some Work-Energy fun to figure this out, but I’m not sure you can do that without knowing the moment of inertia of the fan, which I’m not sure we can find so easily. So, I used the video to measure the time when each blade passed the line. Since the blades are 90-deg apart (𝝿/2 rads), I created a table in Excel with radians & time. I then added a best fit polynomial, and took the derivative of that and solved for y = 0 rad/s. Included all the data, it worked out to 34.3 s. However, I noticed the best-fit line didn’t fit all that best. As commenters above have already pointed out, air resistance is most likely an important factor and can’t be eliminated. I then took just the last 5 seconds of data (figuring with lower angular velocity the effect of air resistance would be less) and repeated the above process, giving a time of 49.9 s.
Obviously air resistance is having a significant impact on the angular acceleration, which makes this problem more complicated. I’d say my answer of 49.9 seconds is definitely low, but possibly within 10%. Or not. Isn’t it a bit unfair to expect within 10% of Act 3 when we don’t have Act 2, only Act 1? Dan wanted some guesses from the gut and since I don’t have time right now for equations, I’m guessing 41 seconds. This is not going to help, but my IQ drops significantly when I try to change the setting on any ceiling fan. Always one too many or too few clicks. Dude, you need to make the model yourself, then. Having me give you the model and have it work is not going to ignite anything. You analyze it, you come up with a model that works, then you show if off to us. That is what I want my students to do. So if youvare being a student, pretend we all just gave you this video and you have to figure it out! Loving this! I did not use any video analysis software, since the time is right on the video. (BTW I love the colored paper showing that the outside of the blade is faster than the inside- in every frame it is always blurrier!) I recorded time rounded to the tenth of a second each time a fan blade crossed the white line. I then made a plot of angle vs. time. It was something between linear and quadratic looking, so along with most others I assumed it was quadratic. I got the computer to tell me the equation of the line and from the derivative got an initial velocity of 7.866 rad/sec and a constant acceleration of -0.2252 rad/sec/sec. These values gave me a time to stop of 34.9 seconds. This was much less then I thought it would be when I guessed. Looking at act 1 I thought it would stop around 60 or 70 seconds. My too high guess would be 120 seconds and my two low guess would have been 30 seconds. I think its interesting that my values for acceleration and velocity don’t match anyone else’s (in fact most posters seem to be disagreeing with each other’s results), even though I think I’m the third one to come up with an answer in the 35-40 second range. I wish I was better at estimating uncertainty in my measurements. I’d like to be able to put a +/- value after my answer. Given that I assumed I could measure time within .1 seconds for each quarter rotation, can anyone tell me what the uncertainty in my answer should be? Quick question. If you turned off the fan again, would it still take the same amount of time to stop? Using an advanced neural network to model this, I’ve calculated 18.382 seconds from the time you turn it off to when it stops. And using a TI-83 quadratic regression, I get that it never stops, but the minimum speed occurs around 42 seconds. A question for the physicists: I remember something about dynamic friction and static friction. Does this work similarly in reverse? Is there some positive speed at which the static friction takes over? And if so, is it calculable from the dynamic friction, or is it another parameter we have to guess at? Wouldn’t the exact time the fan completely stops be largely determined by small-scale features and forces that are inherently hard to model? All of physics is about models and all of those models are wrong but they explain things the best we can with them. I do not know if getting within 10% is possible without making this problem really ugly with a lot of other things built into the equation. So what kind of percent error should I allow here? If the models are useful at all, they should get me somewhere in the ballpark. I’m not requiring perfect accuracy. I’m asking you what kind of margin of error is fair to the difficulties of modeling the world. It’s fair for you to say, “I need more information,” but not every problem does. The physicists in the room all admit to the imperfections of the model but none seem to think they’re insufficiently informed. Great question. I ran it twice. Tomorrow, I’ll post both videos. Maybe. For me, it’s an open question whether or not these models work to any useful degree. The physicists seem to have some confidence, though. I end up with a stopping time of about 57 seconds. I have little confidence in that estimate, though. My model predicts 78.9 seconds. I used your ACT 2 video and used it like a student would. 1. I determined the angular speed of the fan before you turned it off: 9.4 radians/second. 2. I recorded the time each time the fan blade with the sticky on the end crosses the white line, along with the rotation number. Then I converted rotation number to angular distance using (theta) = (2*pi*Rotation#). 3. I graphed the data from #2 in Logger Pro as a Theta vs. Time graph. 4. 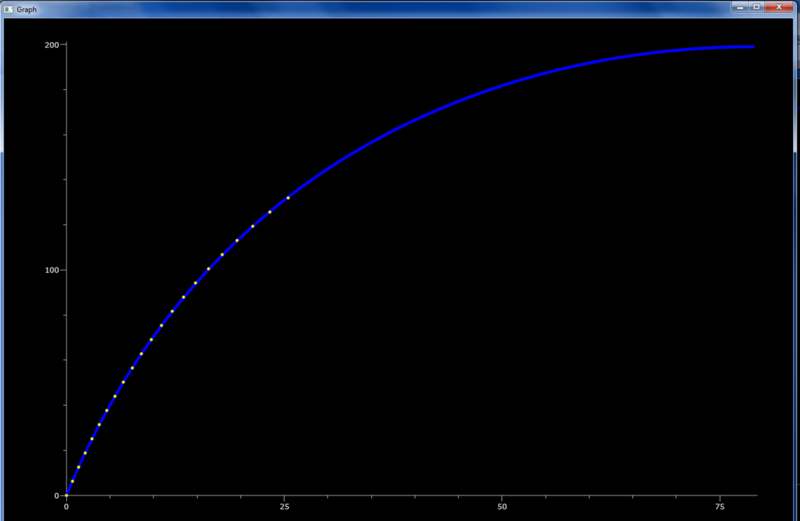 I tried fitting a parabola to the graph, which would be the case for a constant angular deceleration. This would be true if there was a constant frictional torque and no air resistance. But the quadratic didn’t fit too well, so I now have to factor in air resistance. 5. One model for air resistance is that air resistance is proportional to the square of the speed (F_air = kv^2). This makes the net torque on the fan not constant, but decreasing over time. In other words: T_net = T_friction + T_air. * Use that value of alpha_net to calculate omega a short time later. * Use that new omega to calculate a new theta a short time later. And the cycle repeats itself until omega reaches zero. And then had Wolfram|Alpha solve for alpha_friction and b — these would be starting point for the model. 12. I graphed both the movie data and the model data. The data fit a bit at the begining, but not at the end. So I tweeked the alpha_friction and b values until the the data sets overlapped. I’m not sure this makes much sense to you, but I’m dying to see the third act. So can we take your withholding of the full video to mean no one is right to within +/- 10% or are you giving people some time to hit you with what they’ve got before you post who won the keys to the aforementioned heart? From gut and years of lying awake in the humid heat of Vietnam and staring up at the ceiling fan (that rarely came to a stop): 30 seconds. Not caring much, however, for how long it takes a ceiling fan to stop — I turned off the fan and left the room already. Is there any chance you could post the act two video without the white line? It throws off autotracker every time a post it crosses the line. I hope all the physics teachers in the room send their students to this comment stream. Also: re. ignoring air resistance: Maybe you can ignore it in a lot of these problems. I always felt alright about doing that for, you know, a marble rolling down a track. But this is a FAN, everyone. They build air resistance INTO it. Air resistance is its PURPOSE! Love the idea! I will use Monday as a warmup with one of my classes! 1. How did you calculate the value for alpha_fric? 2. Since you’re the only analyst (I believe) who worked with air resistance, why was your answer so much larger than the others? Neglecting air resistance would indicate a fan that would spin down slowly, only slowed by kinetic friction. Right? haha – thanks for a great lesson, Dan. To #2: When you neglect air resistance, you’re assuming the resistance forces are constant from the beginning to the end. Neglecting air resistance gives you an artificially short answer because, in reality, the air resistance goes from being a major factor (at the beginning) to a very small factor (at the end). When you’re pretending that the resistance forces are constant you’re missing the fact that near the end of the fan’s rotation there’s much, much less total resistive torque than initially, so the angular acceleration is much less, so the fan take much more time to actually stop. Frank: Is this the type of modeling/analysis that you would expect your students to be able to handle, or would it be a bit of a challenge for them? Thanks for the explanation on the air resistance, Ben. No one discounted it. Everyone implicitly called it constant whereas Frank had it decreasing. I used a stopwatch and a geometric series. observed how long each of the first ten rotations took and created a geometric series where each term represents the rotations per second. I got an average common ration of .947 and used the formula for the sum of an infinite geometric series using an initial rotations per second of 1.54. I ended up with an answer of 29.03 which seems kinda low but my observed times were probably quite inaccurate. regardless this seems like a good way to approach the problem for an Algebra 2 class, if you are dealing with sequence and series. Did anyone take into consideration air density in their calculations. Things like temperature and relative humidity would also create more or less friction. Because the first thing I do in my head is start comparing what I see to alternate version to make predictions. If I removed the air from the system, would that increase or decrease the time? Of course that would increase the stopping time, that thought brought me right to the idea that air resistance would also be directly proportional not just to surface area of the blade and the velocity of the blade, but the the air density. Thus to knowing this third aspect would in fact, along with Frank’s data, allow for an even more precise answer. I the presence of air resistance early on makes the angular acceleration much greater than the acceleration due to friction alone (which is very small), and so we underestimate the time it takes to stop. Air resistance is the dominant factor in determining the acceleration early on, so if you “neglect air resistance” you really are assuming a much larger value for the acceleration than the actual value. i tried every fan in our house (5- all different shapes) and at every speed setting….they all came to complete rest at 1 min 20 sec to 1 min 34 secs. (Re Fawn not caring) The reason I care is that I pull that cord a few times, and I can’t even tell if it’s stopped running. The slow speed and the no speed seem the same at first. My gut reaction was that it’s close to 2 minutes, but that’s because it seems like forever. The total angular deceleration of the fan at any instant is the sum of both a frictional deceleration (constant and independent of speed) and an air resistance deceleration (depends on the square of the speed). Only problem is, I don’t know the values of alpha_fric or b for your fan. However, if I can get alpha_net and omega at two different times, I can write a system of equations to solve for the two unknown (alpha_frict and b). So task 1 is estimate alpha_net at the beginning and end of the video clip. I did this by fitting a quadratic to just the first 4 data points, and then fitting another quadratic to the last 4 data points. The “A” coefficient in the quadratic fit is ½*alpha_net. And then had Wolfram|Alpha solve for the system for alpha_friction and b. These values of alpha_frict and b would be the starting point for the model. I then tweeked them until the model model matched the data. WillyB answered your second question perfectly! Well, hopefully this convinced you that some model worked, even though it’s messier than a lot of us initially thought. It’s clear, now, that air resistance plays a much bigger part in the process. Makes sense in retrospect since the internal bearings are probably close to zero torque on the blades. I showed the videos to my basic Physics students and these were the questions that arose from our discussion. 1. Does the curved angle of the blade, from a fluid dynamics stand point, in that it produces and downward or upward force on air (depending on the direction it is moving) create a high and low pressure on opposite sides of the blade, and does that decrease the total magnitude of the frictional forces? 2. Does the cavitation in the fluid left behind each blade alter the air flow in such a way to increase frictional forces (forcing the blade to wobble up and down)? Is this also directly proportional to the speed? 3. Is there a drafting effect by a blade on the one behind it that reduces the overall magnitude of friction experienced? Is this drafting effect also directly proportional to blade speed? Just some thoughts from High School seniors. Sometimes physics can predict a good model sometimes it can’t. We don’t know the answer unless we try. The best physics courses will teach students how to try. Process A: look at Act Two and try to see if a useful mathematical model fits the observed data. 2. It looks curved, slowing down with constant acceleration is easy, I’ll try a quadratic fit. Ceiling fans are designed to have very low friction at the axle. Friction would make a fan use more electricity and be inefficient. Additionally it would likely lead to more noise, and no one wants a noisy fan in their bedroom or living room. I wonder if a physics classroom model based off data collected from a “Smart Pulley” would be comparable to this situation. So initially air resistance causes it to decelerate. And then when the speed gets low enough, I suspect friction takes over. So I imagine a graph of acceleration vs. time. There is a constant line close to zero that represents friction. And then there is a curve that starts further from zero that represents air resistance. As the fan slows the air resistance line approaches zero. But when the air resistance line get closer to the friction line, the effects of friction become more important and then the motion would seem to change abruptly. My angular velocity curve never actually intersects zero, leaving me to guess at what point it’s close enough to zero for friction to take over. I’ll guess that friction becomes the most significant retarding force around 50 seconds and it stops at 55 seconds. Approach B: think about which concepts of physics apply to this situation and build a theoretical model based on what those concepts predict should happen. 1. If all the forces are known, and the mass and rotational inertia, then the acceleration can be predicted. 2. I need to know what the friction force is- this can be measured at low speeds by determining how much acceleration results from applying a small, known torque. 4. At this point I start to lose interest in the problem. I wonder if other physics teachers would preserver to create a theoretical model. The model couldn’t answer any specific questions about Dan’s fan- but indicate what we need to know about Dan’s fan to be able to answer the question. So then my thinking shifts gears. And I wonder about what the best way to contribute to the discussion, wonder about the implication for my own teaching, and wonder who’s more likely to be engaged by this task, a research physicist or a high school physics teacher? Although many systems we observe are too chaotic to build an accurate model from basic concepts, introductory mechanics is still useful and important. At its best, a mechanics course would teach students to wonder about how the basic concepts show up in the world around us and give students the skills to determine if a situation is too chaotic for a predictive model. Most classroom systems that we make models from are simplified and students no longer recognize them as real world. Things that naturally happen around us are often too chaotic to demonstrate the physics concepts we want to see. What this discussion is showing me as that we need more systems that are at the boundary of chaotic and contrived. The ceiling fan may be a good example; a bungee jump may be another one. One key question you should always thinking about when designing good tasks for students is do professionals ever do this task in completing their job. By that standard, the purpose and methods for analyzing the fan’s motion shifts. The best ceiling fans are not designed by optimizing theoretical models, they are designed by building something, observing how it works and then building something better. Indeed it is the very rare object or task that is improved by understanding the theoretical model behind it. So then a significant portion of our physics tasks should be to build a system make systematic and relevant measurements, and then improve it based on those. Because, outside of physics teachers, who solves mechanics problems anymore today? I joke around with my kids (AP Physics C) that our entire course covers 18th and 19th century physics, and a physics textbook from 1904 would be just as useful as textbook from today. But it’s not really about solving the mechanics problems, it’s really about understanding conservation of energy and momentum so that when you get to the fun modern stuff you have a sound foundation. You kind of beat me to the punch there. Its all about making sense of the world around us. I wonder what percentage of your loyal readers are physics teachers? I didn’t have time/energy to work on it yesterday, and I’ve seen the answer, but the process is still interesting to me since there were a LOT of inaccurate answers. Since I’ve been teaching AP Physics C, I was thinking in terms of the inverse exponential growth model for the angular position of the fan (A(1-e^(-t/time constant)). Looking at data plots shown here made me hopeful. However A can’t be known since it’s the eventual position of the fan which isn’t known in advance. Taking the derivative of this gives the exponential decay of the fan’s angular velocity A(e^(-t/time constant)). Using others’ initial angular velocities (A = 9 ish rad/s), you can find what time corresponds to the angular velocity being 37% (or e^-1) of its initial value of 9. This happens around 20.5 seconds according to data borrowed from Frank. This data was not as accurate as it could be since it just looked at when the same blade came around to the same point time after time. 20.5 seconds is then the time constant and you have a predictive equation for ang velocity over time. 9ish(e^-t/20.5). I was feeling pretty good about this when I realized that I would hit a road block in that this function never actually reaches zero when a real fan’s velocity does. So at some point you have to set a minimum velocity for the fan where the bearing friction is finally a bigger factor than air. According to Excel and Act 3, this slowest possible speed was approximately .14 rad/s or about 8 degrees per second for this fan. However, you could probably test most ceiling fans and find this critically slow speed without knowing the answer by a little testing since it’s probably stable over a large range of initial angular velocity speeds and perhaps even different models of ceiling fans. I think a Pre-Calc class or a Physics class that is familiar with exponential decay could use that model to do a pretty good job of predicting the stopping time for a ceiling fan. It would also be great practice for using Euler’s number, natural logs and solving exponential equations. I spent a little time fooling around with various differential equations to explore how well they modeled the fan’s behavior. I created a brief writeup of the results which you can see at http://www.acasper.org/2012/03/09/modelling-a-spinning-fan/. The post describes two cases, one where the drag is proportional to velocity and another where drag proportional to velocity squared (similar to what Frank talked about above but with a constant drag coefficient). Based on these models I’d predict the fan to stop somewhere around 70 seconds. Thanks for posting this video, I was looking for something just like this. I was actually planning on propping my bike upside down and filming the tire spin freely this weekend before I came across your post. So you saved me some time! Sue, thanks, I was thinking of a ceiling fan with an on/off switch, but I know exactly what you mean with a pull cord. I’ve done that a few times and had to stick around to see. I appreciate seeing all the discussion, only wish I could understand it more. On the one hand, air resistance surely ought to be the dominant cause of deceleration when the fan is moving quickly. The purpose of a ceiling fan is to circulate air and this is done by the air resistance on the blades. If air resistance is not the dominant cause of deceleration at “working speed” then we have an inefficient ceiling fan. On the other hand, it seems natural that air resistance should play almost no part in the deceleration when the fan is going very slowly. Everyday experience indicates that air resistance is very small when the speed of an object is small (relative to the air). I don’t know the nuts and bolts of physics well enough to know how “air resistance” and “other friction” should fit together into a formula, but both need to be taken into account. One “hands on” way to see that a parabola is not a good model is to use part of your data to build the model and see how well it “predicts” the other part of your data. I fit 4 parabolas to Frank’s data using: 1st six values, 2nd six values, 3rd six values, last six values. The predicted stopping times for the models are 19 sec, 30 sec, 36 sec, and 47 sec. This sort of analysis is easily accesible to students and clearly shows the danger of extrapolating with a model for a situation you do not understand very well. It is not so hard to build a spreadsheet for Frank’s model. It is interesting to play around with the choices for the values for the two sources of friction. Constant friction alone does not produce a good fit. Using wind resistance friction alone fits the data very well but produces a model where the fan never stops. How stupid of me to ignore air resistance for a device *designed* to plow its way through air! I feel such shame. I work at a company with 5000 engineers, this is exactly the stuff we do. Buildings, bridges, airplanes, cars, even iPads and iPhones are not designed hit or miss. Speaking of fans, they exist in turbo pumps, jet engines and power plants. You don’t just take an educated guess. It takes solid theory and experimentation to get these things to perform. Teacher school should include a year of interning at companies that rely on these subjects. I realize that a full analysis of a ceiling fan looks intimidating, but that is exactly how fans are designed, albeit not the ones you buy at Lowes that are made in China. @Robert, when you say “I work at a company with 5000 engineers, this is exactly the stuff we do. ” I wonder exactly what you mean? Here’s why I ask. I loved Frank’s solution, especially the bit about numerical integration. We teach our kids how to solve these equations and we say they model real world situations. But the real world is actually more nuanced as this fan problem showed. And solving the actual equation could be really tough. However, with the use of computers and software, we can numerically solve them. If you look at the actual equations that Frank used in his program, there wasn’t any one that was too complex (most were linear or simple quadratic). Yet we ask kids to solve equations that are sometimes needlessly complex. So my question to you Robert is whether the “stuff” you were referring to was closer to numerical analysis or algebraic analysis. My guess is numerical but I have no clue really. I haven’t read all comments but I guess that in the explanation for that weird thing that considering resistance provokes larger stopping times could be explained by something called angular momentum. I guess it will take more time to stop it if the mass would be only in the end of the blades than if it would be distributed homogeneously. Dan, could you put for me an extra mass at the end of the blades and try again measuring the stopping time? If that is different then there would be the explanation for the large stopping time you recorded. PS. By the way, let me tell you I am a fan of your approach to teach. in case you put that extra weight in the end of the blades be careful, it could be dangerous. Completing my recent comment, may be the quantity that should be used to fit the data is the “Rotational Kinetic Energy” Er=Iw^2/2. Where I is the moment of inertia (a constant value, equivalent to the mass in linear velocity) and w is the angular velocity. That energy should be dissipated completely before the fan is stopped. I guess that considering a constant angular acceleration from the initial time will result in a wrong value for the friction (higher), and thus a shorter stopping time will be obtained. Friction losses from the axis of the fan would be constant in time I suppose, but drag on the blades will be dependent on the angular velocity (w^2 dependence). This will result in a large losses of energy in the beginning, and very small losses of energy at the end. This effect can be misleading about the value for the deceleration, and thus it can result in wrong answer. Frank did not solve the fan problem with numerical analysis, he employed numerical analysis in the solution. He started with physics, a kinematics problem involving rotational inertia and an opposing torque. He further refined the opposing torque as a combination of a constant element (the motor/bearings) and a non constant element (the air resistance). He chose the v^2 version of the drag equation because in problems such as fan blades and air that makes sense (there are other drag equations depending on the circumstances). Through all this he has been using physics and algebra to mathematically (quantitively) rationalize and describe the kinematics of the fan, with a guiding purpose, to determine how long it will spin after it is turned off. Finally, after the physics and algebra he applies calculus (because of the time element) and obtains a differential equation, a (small) cliff that he circumvents using a step wise approximation, that requires him to refactor that situation algebraically into a program that must also correctly approximate the solution of the differential equation. He also employed some data analysis to determine the friction coefficients. To answer your question, there is no “or” between numerical analysis and algebra (and calculus). They are woven together in the same cloth. I think what you are asking is whether we “solve” differential equations analytically or numerically. We solve them the same as we did 100 years ago, if a solution exists and we need that we use that and if not then we use numerical methods (which have existed for as long as differential equations existed). It also depends on the situation. This fan differential equation might be part of a bigger problem and thus there would be no purpose for a numerical result at this point. We would still have to tread through more physics, algebra and calculus and then (likely) at the end of all that numerical methods might be employed. There is some confusion here about the meanings of “solve” and “numerically solve”. When we solve an expression we generally mean to put it in a closed form with the dependent variable on the left of the equals. For example, to solve the expression “y – x^2 = 0” we get “y = +/-sqrt(x)”. But that isn’t a numerical solution because, except for special cases, we cannot calculate the sqrt(x) exactly, we can only approximate it using numerical methods, either by hand or with a computer. So, when a numerical result is the goal, numerical methods are involved regardless. But numerical results are not always the goal and generally they are almost never the intermediate goal. It takes a considerable amount of familiarity with the math (and in this case the physics) and the problem to know where and when the problem favors numerical or analytical methods. On top of that it also takes a considerable familiarity with numerical methods (algorithm and programming) to employ them, especially to do a simulation as Frank just did. I hear what you are saying, but it isn’t as easy as Frank makes it appear in a post. Like watching a musician perform, it isn’t as easy as they make it look. If you analyze what Frank did you will realize that there are a number of proficiencies involved and as far as I can tell there is no easy and quick formula for teaching all of that in one fell swoop. It boils down to interest, coaching and a lot of practice. In the beginning it is unrecognizable as what Frank just did, but at some point the fruit of all of that work starts to become recognizable and then it matures and then, after even more work, it becomes Frank. PS: My point to Garcia was that without the mechanical (physics) analysis of the kinematics of the fan, Frank wouldn’t have a mathematical model at all. This was not a problem to be solved by data analysis and modeling (because there wasn’t enough data). This was a physics problem from the get go. Physics starts with how and why and derives the math from that. Regardless of its simplicity, this was a very realistic engineering problem requiring theory (physics), mathematical analysis (algebra calculus), data analysis (the coefficients) and numerical methods (the simulation). @Hansen, nice post. I agree, this is a physics problem. A person with limited understanding of a situation is very likely to come up with a poor model, or use the model inappropriately. I think it sends a very poor message to have students use data to model situations they do not understand – analagous to quoting statistics without researching the issue thoroughly. if you are willing to let students come up with a model, discuss creative ways to check the model and the reasons it doesn’t work, and lead them through something like what Frank did. Fans freak me out. say a fan has a 6 inch radius, right? At the 2 inch point, the fan might travel 2 revolutions per second. C = pi x R, yes. So in 2 seconds in would travel about 12 inches , rounding pi down to 3, of course. At 6 inch part the blade travels it will travel approx 36 inches in 2 seconds. Then I get confused when I watch Sagan say that the inner parts of the galaxies move slower than the outer spirals. I guess house hold mechanics don’t hold true in celestial mechanics. I live in florida and have to watch fans every day…HELP!